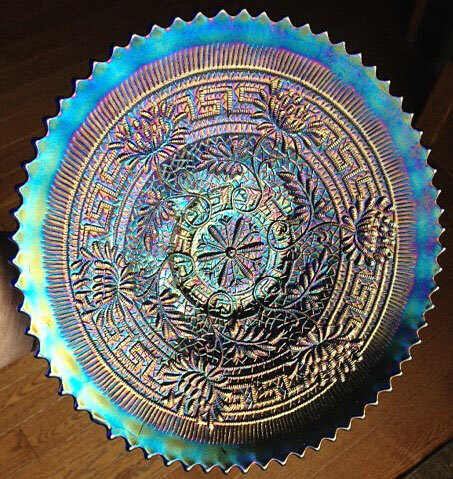 Occasionally readers of this Web site send me photos of interesting or unusual pieces. This photo of a Daisy Dear Jack-in-the-Pulpit small bowl in amethyst was sent to me by Jeff Schleede. He believes it is the only one in that color known at this time. Could well be. I have no records of any JIPs in that color selling in the last 25 years. 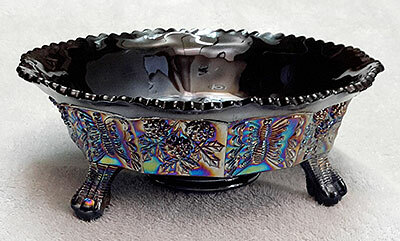 Michael Deptowicz sent this photo of his Constellation compote--in amber of all colors. Michael said he had not heard of this color in the pattern. I checked my auction database of sales over the last 25 years and of the more than 200 Constellation compotes listed, none were in amber. Quite a find. This photo of a four-piece water set was sent to me by Greg Lockhart. 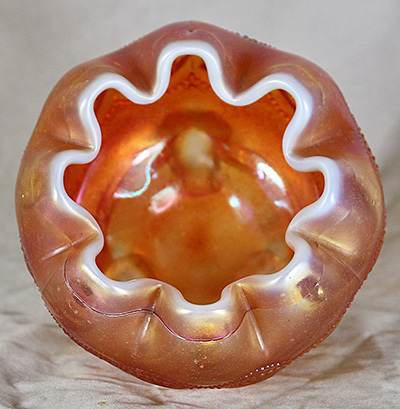 He called it Enameled Lily as he could find no reference to any similar pattern. He checked with Barb Chamberlain who said they have one in their collection and use the same name. 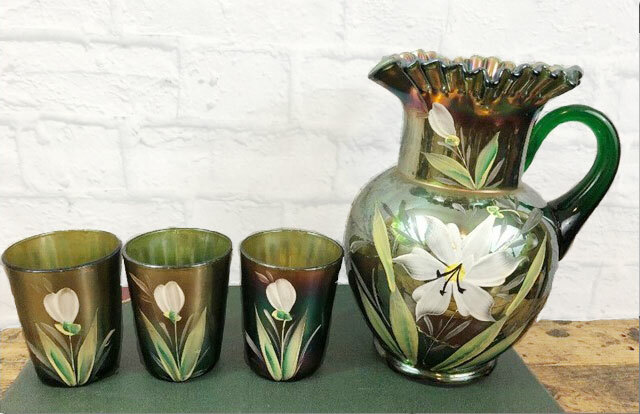 Tom Burns had also sold a Pitcher in the same pattern that he also named Enameled Lily. 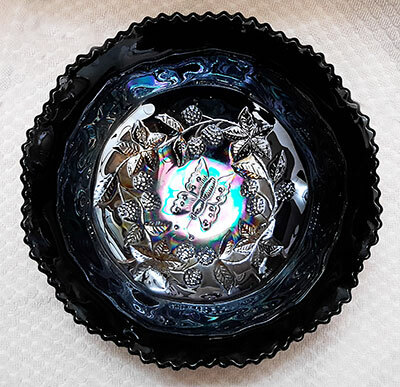 Mel and Lynne Dey of Canada sent me these photos of a black carnival glass Butterfly and Berry large bowl they had bought at an online estate auction. They point out that no light can be seen through it even with a bright LED lamp. I have never heard of a Butterfly and Berry piece in black carnival before. Most unusual. Mel subsequently told me he discovered the bowl was a fake. Herve Glorioso sent me this photo of a Sailboats compote in amethyst in early 2019. He points out that while compotes are found in blue and marigold, none have been reported in amethyst. 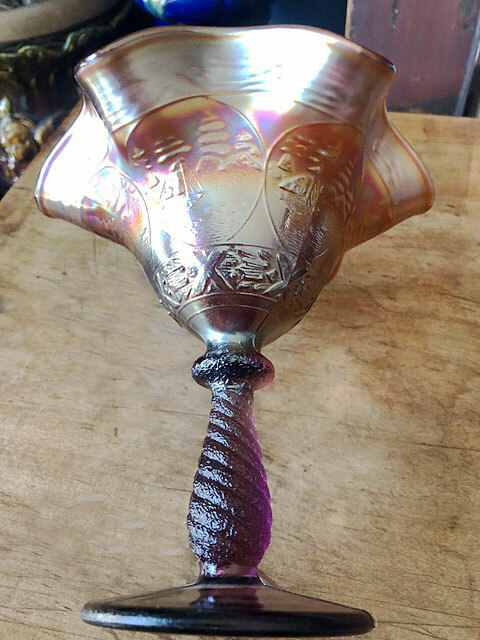 Amethyst goblets, from which the compotes are made, are known. 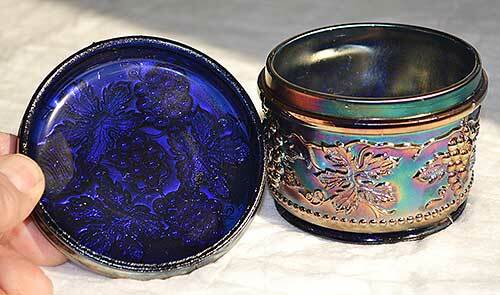 Dave Noyes sent in these photos of his Dugan Vintage powder jar in blue. Most unusual. 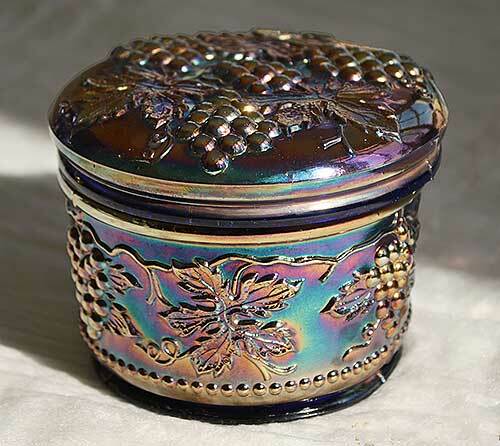 In checking my database of auction sales of carnival glass going back to 1994, I have only 124 items listed as Dugan Vintage powder jars--none of them in blue. What a find! Forrest Nagel sent me this photo of a recently acquired Twigs vase in what is apparently yellow opal. I checked around and could find nobody who had seen one like it. He reports that it is 7 1/4 inches tall, is 2 1/4 inches across the mouth and has a base diameter fo 2 3/4 inches. Seeing this photo prompted me to check into other Twigs vases made in opalescent glass. You can read of my findings on my Twigs page. 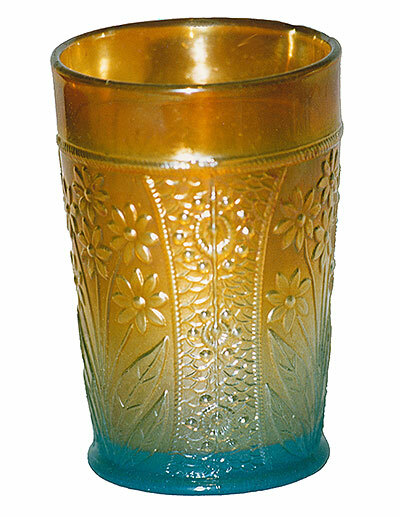 Don Ruppel sent me this photo of a Persian Blue Bouquet tumbler he had once owned. Said he had found it in an antique shop. He subsequently sold it. The only one known. This is the only the second blue Embroidered Mums plate of which I've heard. The photo was sent to me by Michel and Francine Jacob of Canada. Forrest Nagel sent me this photo of a blue Fenton Chrysanthemum rosebowl he owns. He was wondering if I had heard of any others. I checked my database of auction sales which goes back to 1994 and could find none in blue. Quite a rare piece. 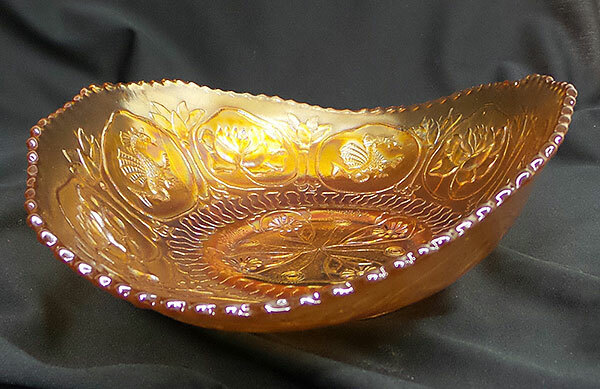 Ardonna Bucher sent me this photo of an unusual Dragon and Lotus banana boat shaped bowl in marigold. I didn't remember seeing or hearing of such a shape in the pattern before so I checked my database of auction sales going back to 1993--a total of more than 1,800 pieces in the pattern. No listing of such a piece. Must have been a workman's whimsey, done just to see if he could do it. 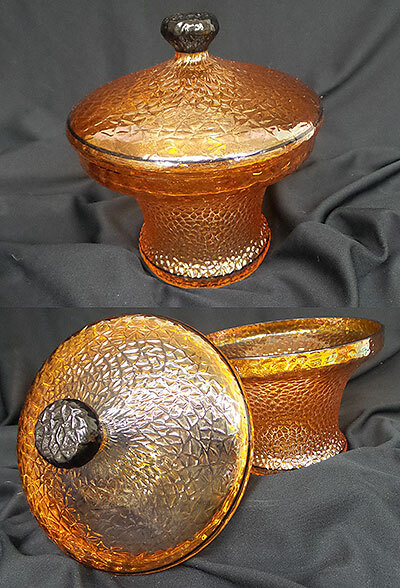 Ardonna Bucher also sent me these photos of her Halloween covered bowl in an unusual shape. The usual marigold with black trim--thus the name. Quite a find. 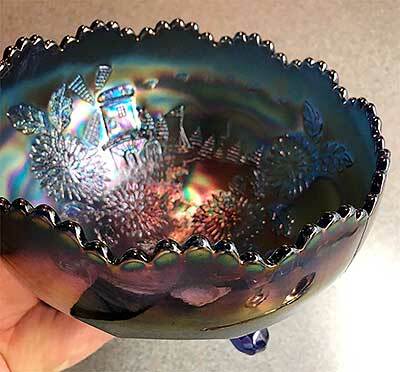 In October of 2018, Francine and Michel Jacob of Canada sent me this photo of an ice blue 10-inch Fruits and Flowers bowl wondering if I had ever heard of another. I checked my database of auction sales going back 25 years and could find none listed. No one I've spoken with has seen one either. 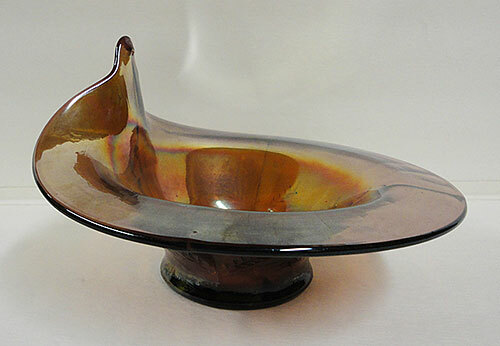 Francine and Michel are members of the Quebec Carnival Glass Association. I asked how they came upon it and was told that Michel's half-brother, Jacques Temblay, had found it a couple of years ago at an antiques show in the Quebec Province east of Montreal at St-Charles-sur-Richelieu. The seller didn't know where it came from. 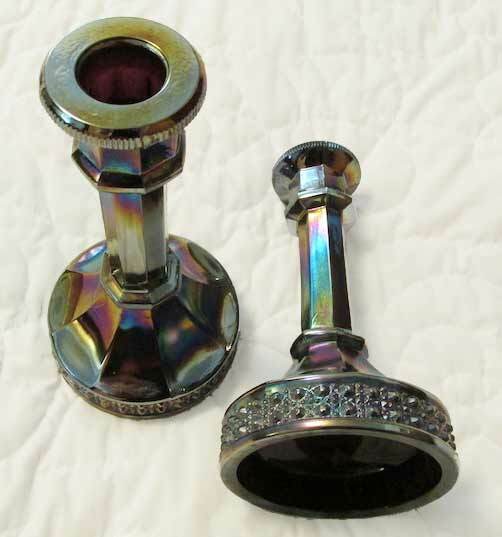 Carl Booker purchased these Flute and Cane purple candlesticks from eBay in 2018. He asked me if I knew of any other sticks in this color. I searched my auction database going back 25 years and could find only a handful of other candelsticks, only in marigold and smoke. Carl notes that they are marked LIG, so they are contemporary. 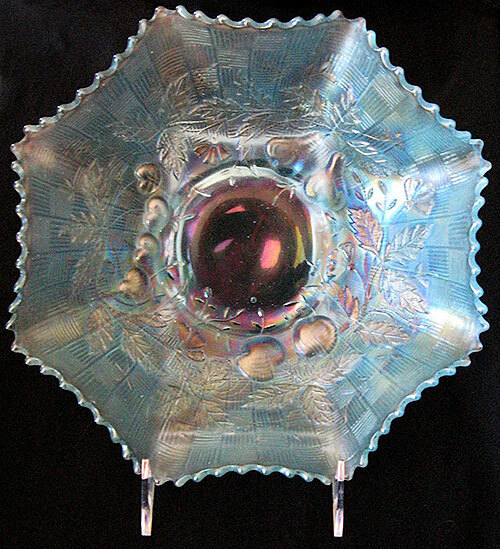 When Carl sent this photo to the Hooked on Carnival website, Mitchel replied that "Imperial by Lenox in Amethyst had a short run...about the 1st 6 months of 1981. This item is not on my list of pieces made in this color. 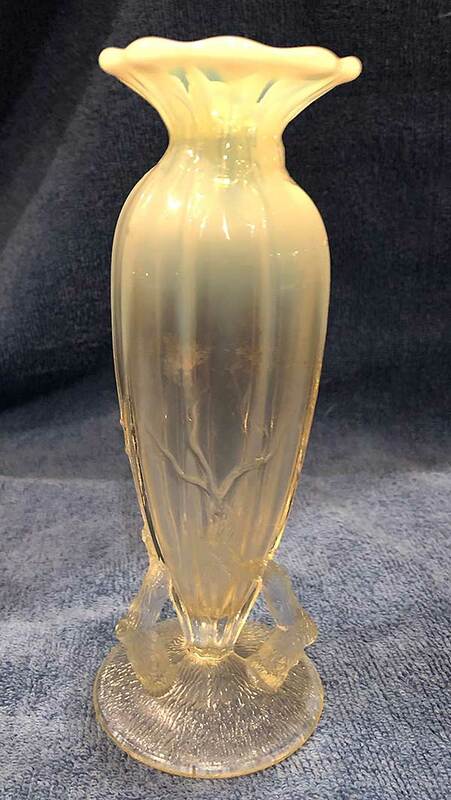 That said, there is always the possibility that when the molds sold, the mark was not removed and someone else (Summit Art Glass hardly ever removed the existing mold mark) made this item. But I have not seen this by anyone." Dave Doty here. In September of 2018 I made a quick trip to our local grocery store. 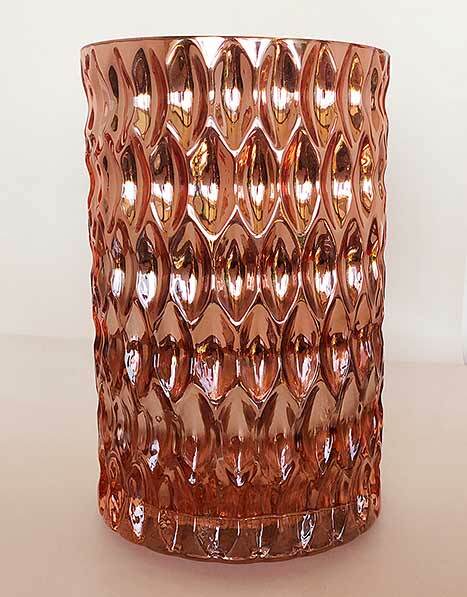 As I walked past the floral department, a group of these iridized vases caught my attention. First time I'd seen the pattern. They were all the same pattern in two different colors, both on clear glass. This one has a reddish iridescense, the other a sort of marigold. Each measures 8 inches tall and 5 1/4 inches across. 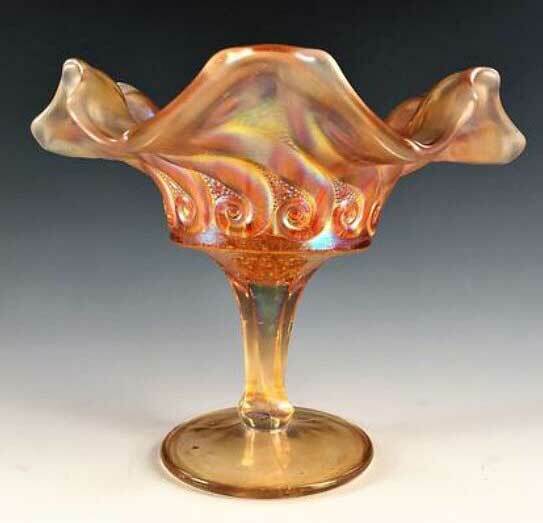 According to the label on the base, they were made in China and offered as candleholders. The store obviously regarded them as vases. The pattern name was Debi Lilly. Price: $11.99. 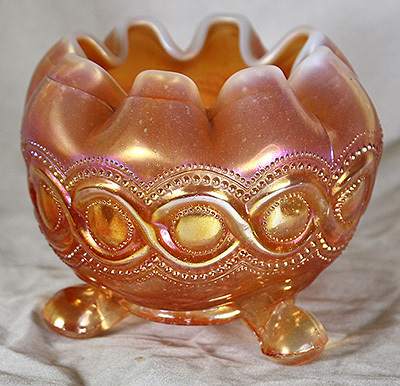 Terry Jondahl sent me these photos of a peach opal Beaded Cable rosebowl he recently acquired from England. As far as I know, it is only the third example known.